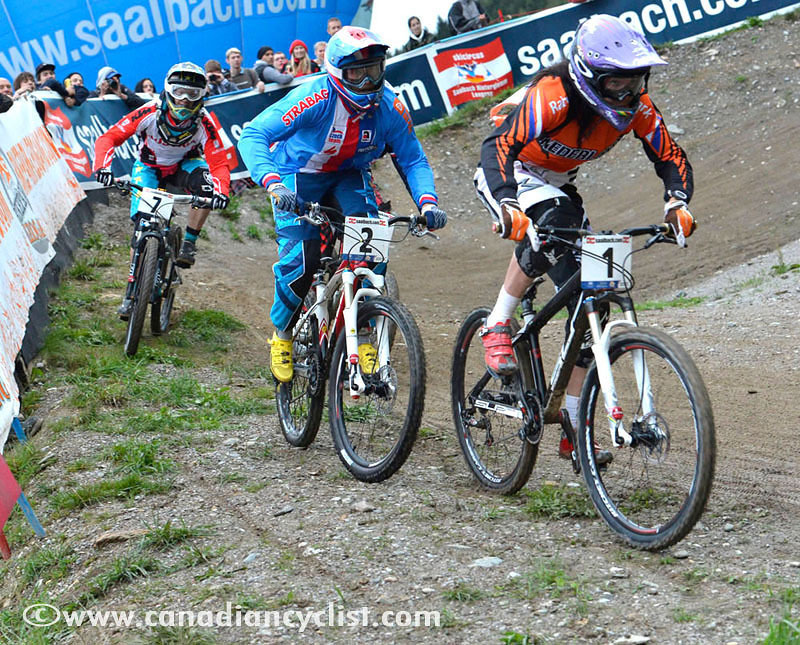 The first medals of the 2012 UCI Mountain Bike and Trails World Championships were awarded Saturday night in Leogang, Austria, for the men's and women's 4-cross. Anneke Beerten of the Netherlands won her second career title, while Switzerland's Roger Rinderknecht won his first title in the final race of his career. 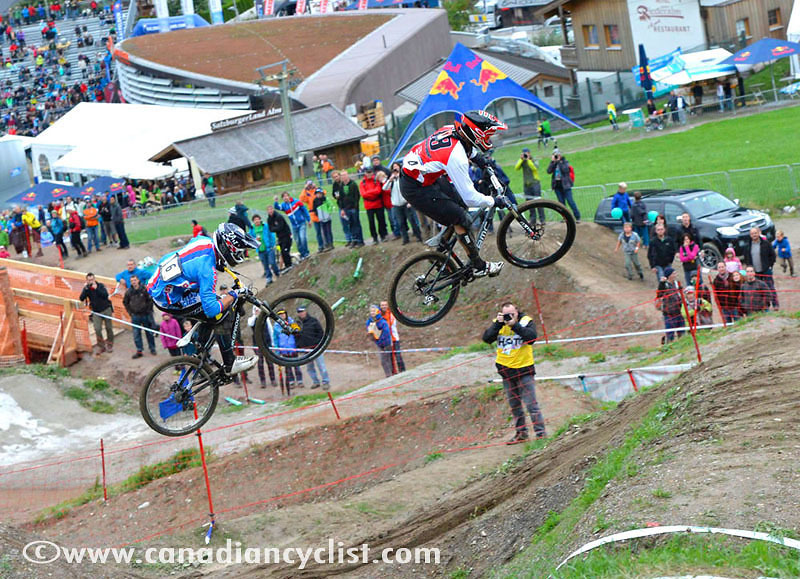 The crowd favourite 4-cross did not disappoint the thousands of fans who lined the course. It was clear early on that the men's race was between the Swiss and the Czech riders. The two nations split the top four spots in qualifying, and dominated the heats on the way to the final. Rinderknecht was joined by countryman David Graf for the final, with Czech team mates Tomas Slavik and Michael Mechura taking the other two spots. On paper, it should have been Graf who won, after qualifying first and winning every one of his heats; including beating Rinderknecht in the semi-final. However, Graf tangled with Slavik just after the start gate, when the Czech rider moved out of his lane, causing both riders to crash. Rinderknecht took the lead from Mechura out of the first corner, fought off an attack after the second corner and then rode clear to take the title. Mechura took silver, with Slavik the first to get up from the crash and grabbed bronze. "This is the last race I am ever going to do in my career, so I really wanted it to be a special night," commented Rinderknecht. "I felt good all night. Didn't have the best legs ever, but I felt it was coming together. It worked out on the end. The other two guys unfortunately came together on the first straight, so it wasn't the battle to the line, but nevertheless I am extremely happy." "I really cannot believe it. I really did not expect to do that good in the beginning. I knew I was in good shape, but I wasn't sure what to expect from my bike handling point of view. But I felt comfortable right away from the first practice, so I knew if everything went perfect it could be my night." Beerten came into the eight rider women's race the favourite, and did not disappoint. After qualifying first, the Dutch rider won her semi-final to get into the championship race, and was joined by Romana Labounkova (Czech Republic), Celine Gros (France) and local Austrian favourite Anita Molcik. Beerten got out of the gate fast and led Labounkova by the first corner. The Czech rider tried to stay in contact, but by the end of the second straight, Beerten was clear and on her way to her second 4-cross title. Labounkova held on for silver, with Gros taking bronze. Words cannot describe how I feel," exclaimed Beerten. "It is unbelievable. It started out as such a hard race, I didn't have the gate that I wanted, and I pulled it off in the first corner. I just thought to my self 'Don't brake, just go' and that's what I did. It seemed to work. I am so happy.